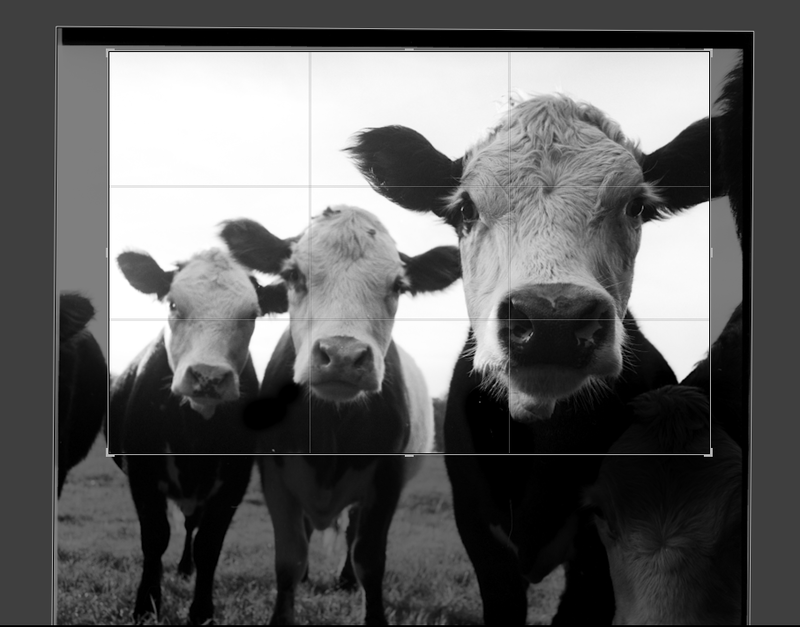 Since I started using a camera I have been following discussions about cropping images. Should a photo be cropped or should the final print show the untouched outline of the captured frame? People who are pro cropping may question why their artistic expression should be limited by frame or sensor sizes that someone came up with in a technical lab. On the other side photographers who see cropping as a sin would probably use Henri Cartier Bresson as an example of a master who never cropped his images. Actually he never cared about the printing part of photography so he had to get it right when pressing the shutter. Personally I can easily address that topic. I am not Henri Cartier Bressson, so I have to crop. To me cropping allows me to bring a photo back to the exact expression and emotion that I saw when I took it. Ok, skip that crap. Honestly, sometimes I shoot a photo out of instinct and then I look at it on the screen and wonder what I can do with it. Of course most of the time I know what I want to shoot but it happens that I am using the wrong format, lens, etc. 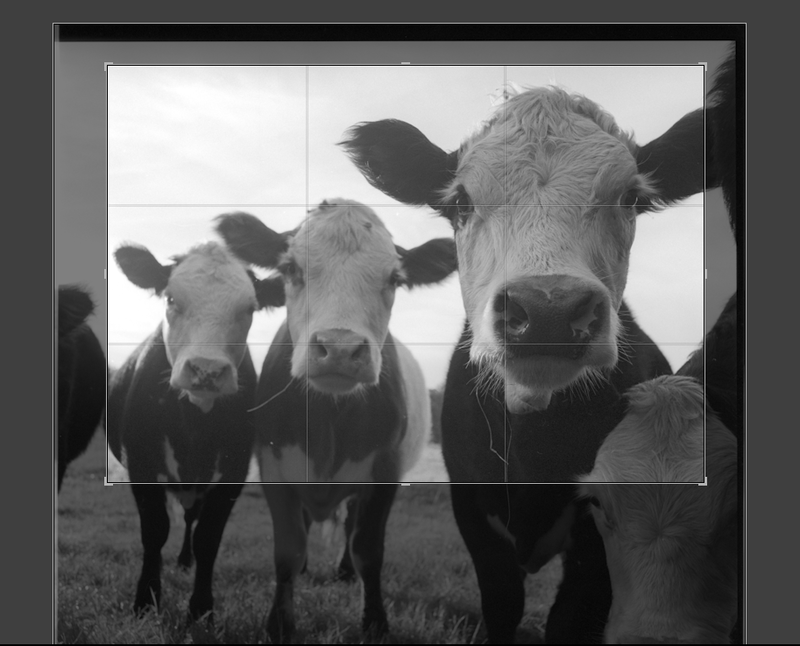 Especially the Leica M frame lines are not very accurate, which leads to more cropping in the workflow. Ideally a photographer pre-visualizes a photo. That means that he or she visualizes an exact image before the shutter is being pressed. Its about knowing how the film/ sensor, shutter speed, aperture, color conversion, view point, etc will impact the final result. All this happens within split seconds. That’s why I like street photography. You have to see how the stars align before they align and you have to find the right spot to capture it. Just reacting to the aligned stars would be too late. By the time you are ready they will have moved on. So you have to understand people’s behaviors in certain situations in order to anticipate what is most likely going to happen. 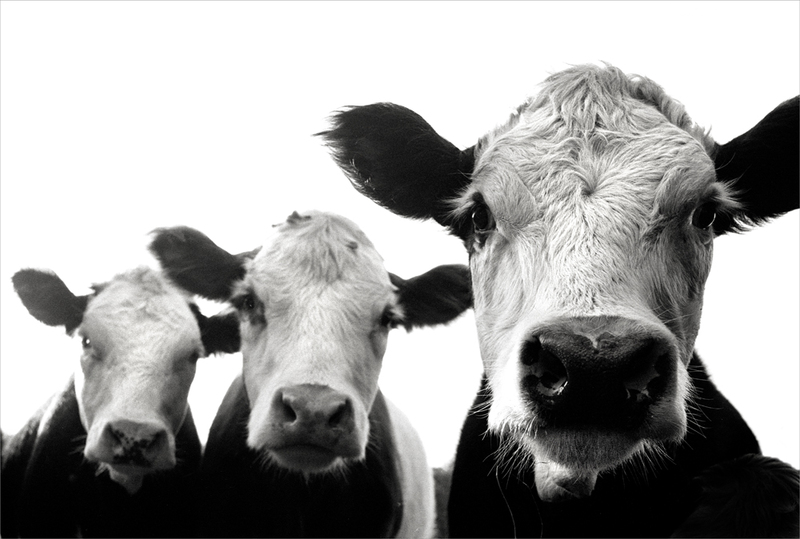 Anyway, why cows? 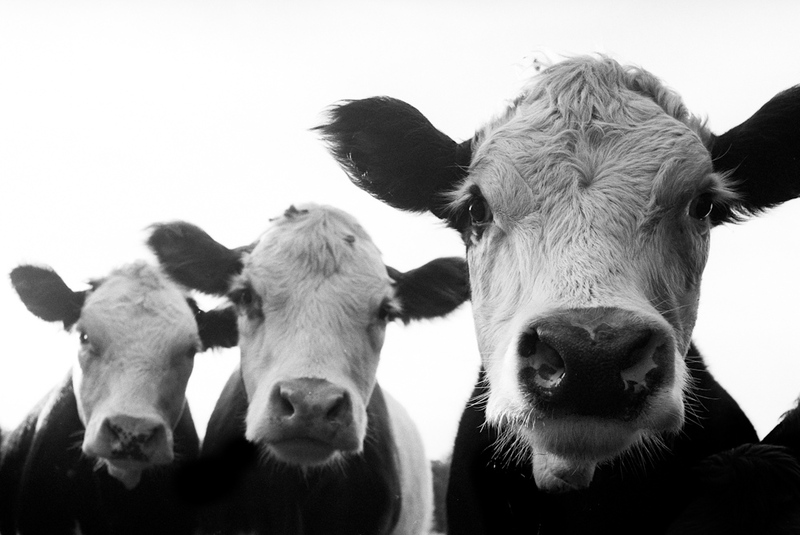 The cows are a good example of an image that I totally post-visualized. Yes, that is not a typo. I took that image in Fall 2001 just outside Lincoln/ Massachusetts near Walden Pond along Route 2. (Don’t turn left at Walden Pond, stay on Route 2 and take the next left.) There was a large field and when I arrived a blimp was hovering over the grass. I was equipped with a Rollei 6006 camera and a 50mm lens. The blimp moved on but when I looked up from my waist-level viewfinder a small group of cows had crossed the field to say Hello. I guess they were bored and happy to see some stranger. So I took a few shots of them. The waist-level viewfinder allowed me to get close to the ground and to use the gray sky as a backdrop. Somehow I was hoping for the cows to align and to look into the camera but they moved constantly with their heads as if they had eaten a box of caffeine pills. 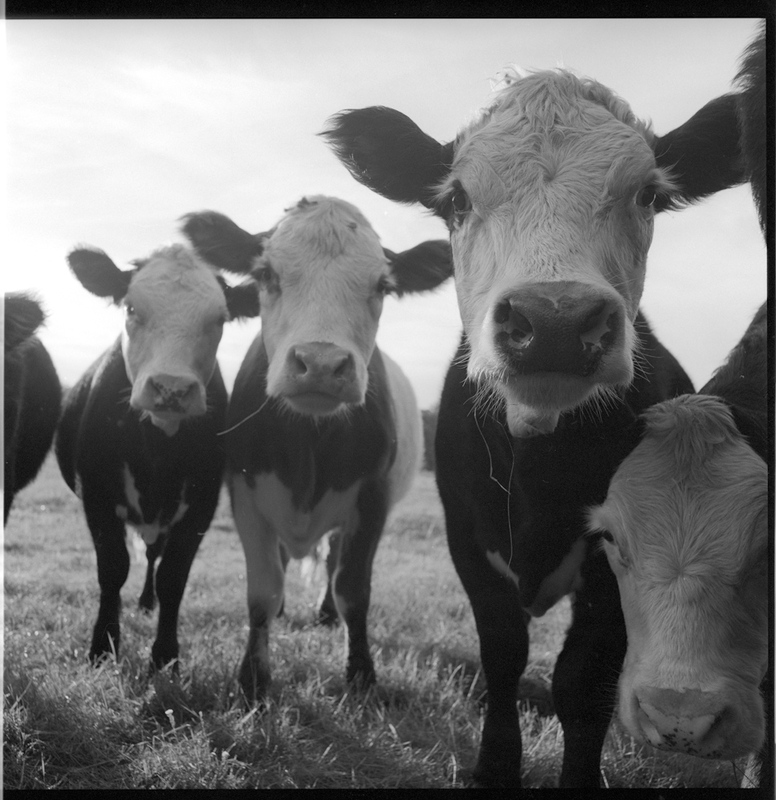 When I went home and developed the film I got one shot that looked OK. Still, it was a boring image. I looked at it and realized that while the three cows in the center looked fine, there was just too much stuff around them that distracted. First I cropped everything out that was just half in the frame. It started to look tighter. Still there was a cow head in the bottom right corner that distracted. I burned that area to make it darker. Actually I wanted it to disappear. I changed the crop and left more space at the top and less at the bottom to give the entire image room on one side. BTW Having this image in your dining room can have an impact on your eating habits. In case you are interested you can order that print by clicking on this link. This photo is great and works much better cropped. Cartier-Bresson did not copy because the then-new 35 mm format was a statement of “purity”. Many photographers in the 70’s used to print enlargements showing the borders of the 35 mm frame as a badge of authenticity. We should be over with this discussion now but apparently it won’t go away. You are totally right. Still my goal is to get it right from the beginning. But sometimes it just doesn’t work out and I have to crop it tighter. And, as described, there are moments when I realize that a totally different view would make a much better image. If you allow yourself to burn, how could you censure yourself when you crop? Totally. You either manipulate or you don’t. I think people can do whatever they want, unless they do journalistic work. Everything else I just judge by the result. Keep on cropping! Great photos. Welcome to 300 Summer!